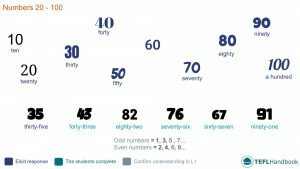 A collection of activities, games and resources for teaching numbers to beginners. This plan contains a lead-in activity, some fun ESL activities and games, along with a list of ESL resources from around the web that we think English teachers can use to supplement their lesson plans. Start by stepping through the multiples of ten up to a hundred. Practice for as long as you feel you need to before moving on. After that, demonstrate how we form the other numbers. Elicit as much as possible by pointing to the board and using your fingers. An excellent little pair-work activity where students practice the target language for the lesson. First, divide the students into pairs. They will then take turns writing down numbers for their partner to say out loud. You should monitor for the correct pronunciation. The students will attempt to make statements containing numbers from prompts that you'll write on the board. There are twenty-five of these in the classroom. Student: There are 25 chairs in the classroom. Finally, add some more prompts and have the students work in groups to write the correct responses in their notebooks. The students will count in a circle with the aim of reaching as high a number as possible without making a mistake. Start by arranging the group into a circle. Then, in a clockwise direction, students take turns saying the next number. If an error is made, we start over. The mistakes counted could be repetition, waiting too long, or another student shouting out the correct answer. Mix it up by switching to odd and even numbers or simple multiples. Here are a couple of fun ESL games that you can use to teach numbers and counting to beginners. As usual, we only include game ideas that require no more than a whiteboard, markers and dice. In this fun elimination game, students must count in a circle, omitting a number based on a given multiple. Start by arranging the students into a circle. Then, explain to the students that they have to count in a circle, but can't say numbers that correspond to a specified multiple. For example, if the multiple is 3, they must say “buzz” instead of 3, 6, 9, etc. Start off with easy numbers first. If a student makes a mistake, they are eliminated from the game. A straightforward version of bingo that you can play with younger students. You can direct your adult learners to this fun numbers quiz at Woodward English. For kids, you could incorporate this fun numbers game from eslgamesplus into your ESL lesson plan. Eslcollective have a great collection of free ESL worksheets for teaching numbers. Select the one that best suits your class level. If your classroom has video capability, the following animation by The Singing Walrus works fantastically in classes for kids. We hope that you were able to grab a few ideas from this lesson plan. Our next free lesson plan is on Family and relatives. Be sure to check out our complete list of ESL lesson plans for beginners (A1 Mid-level), as well as our entire collection of lesson plans from beginner to intermediate. Also, if you are an Android or iOS user, the best way to view this content is through the TEFL Handbook app. An ESL lesson planner for English teachers, designed for in-class use.